Ulleung-do (Ulleung Island) is one of the most preserved primitive natural environments in South Korea. The project site has a magnificent natural landscape. 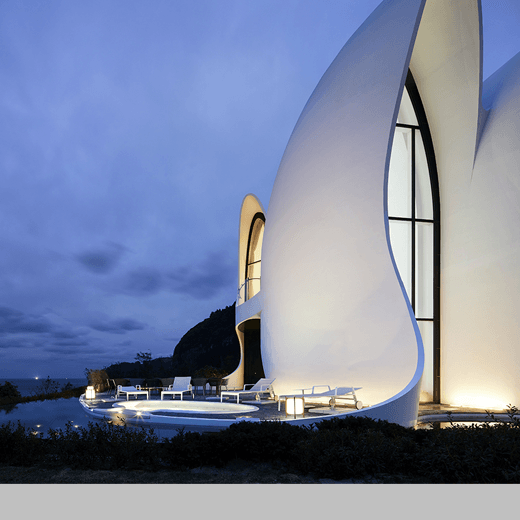 This project is a small boutique resort consisting of two villas built on Ulleung-do by Kolon Glotech, a subsidiary group of the Kolon Corporation. Villa KOSMOS consists of four suite rooms, banquet facilities, a restaurant, a sauna and an infinity pool. Villa TERRE consists of eight deluxe rooms and a cafeteria. The outdoor space has a garden with a marvelous view of the sunset and the passing of the moon in harmony with the landscape. Designed by: Chanjoong Kim, Choonglyeol Lee and Jongkil Kim of THE_SYSTEM LAB and the LSI Team of Kolon Global Corp.